Cake icing can be made into creative homemade candies with the addition of custom flavors and colors. Cake icing is a very basic combination of whipped egg whites and powdered sugar. 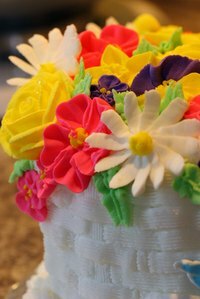 The low moisture content of cake icing causes it to dry out quickly and develop a light, crisp consistency. Using the icing as a candy base allows you to experiment with different designs, colors and tastes to create a variety of cake icing candies. Whisk the egg whites and lemon juice vigorously a mixing bowl until they form stiff peaks. To test, scoop up a dollop of foam with the whisk and hold it over the bowl--if it flattens back into the whisk, it's not stiff enough. Stir slowly, as you sprinkle in the powdered sugar a little at a time, until it is fully combined. Add a couple drops of flavored syrups, extracts or food coloring to the icing and gently fold them in with a spatula. Fill the piping bag with icing. Use the spatula to gently compact the icing and press out any large air pockets. Lay out the plastic transparency on a cookie sheet and clean the side that is facing up with a dry paper towel. Buff vigorously in a tight circular motion to make the plastic shiny. This will remove any dust that is clinging to the surface because of the static. Fold a new paper towel in half three times and dip a corner into vegetable shortening so that it is lightly coated. Spread the vegetable shortening in a thin layer on the clean upward-facing side of the plastic transparency. Pipe the cake icing directly onto the greased transparency in creative shapes and designs that are no more than one inch tall. Make a variety of forms, such as small stars, circles and letters, by creating an outline then filling it in. Create a simple flower by piping out a small center circle, petals, a stem and leaves. Slide the cookie sheet into the refrigerator and allow the icing candy designs to dry for 8 hours or overnight. Lightly rest a single sheet of wax paper over the candies to protect them from falling crumbs in the refrigerator. Store dried icing candies in a food-safe glass or plastic air-tight container in the refrigerator for up to a month. Dip icing candies in melted chocolate for an even more extravagant treat.